A sound reinforcement system is the combination of microphones, signal processors, amplifiers, and loudspeakers in enclosures all controlled by a mixing console that makes live or pre-recorded sounds louder and may also distribute those sounds to a larger or more distant audience. In many situations, a sound reinforcement system is also used to enhance or alter the sound of the sources on the stage, typically by using electronic effects, such as reverb, as opposed to simply amplifying the sources unaltered. A typical sound reinforcement system consists of; input transducers (e.g., microphones), which convert sound energy such as a person singing into an electric signal, signal processors which alter the signal characteristics (e.g., equalizers that adjust the bass and treble, compressors that reduce signal peaks, etc. ), amplifiers, which produce a powerful version of the resulting signal that can drive a loudspeaker and output transducers (e.g., loudspeakers in speaker cabinets), which convert the signal back into sound energy (the sound heard by the audience and the performers). These primary parts involve varying numbers of individual components to achieve the desired goal of reinforcing and clarifying the sound to the audience, performers, or other individuals. Sound reinforcement in a large format system typically involves a signal path that starts with the signal inputs, which may be instrument pickups (on an electric guitar or electric bass) or a microphone that a vocalist is singing into or a microphone placed in front of an instrument or guitar amplifier. These signal inputs are plugged into the input jacks of a thick multicore cable (often called a snake). The snake then delivers the signals of all of the inputs to one or more mixing consoles. 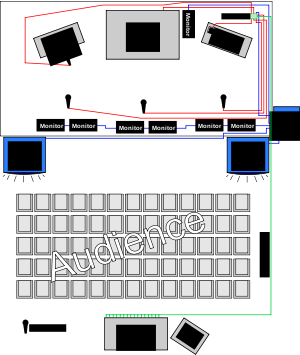 In a coffeehouse or small nightclub, the snake may be only routed to a single mixing console, which an audio engineer will use to adjust the sound and volume of the onstage vocals and instruments that the audience hears through the main speakers and adjust the volume of the monitor speakers that are aimed at the performers. Mid- to large-size performing venues typically route the onstage signals to two mixing consoles: the front of house (FOH), and the stage monitor system, which is often a second mixer at the side of the stage. 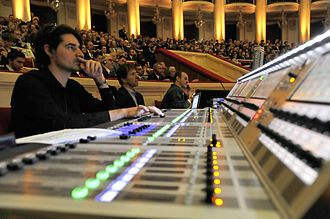 In these cases, at least two audio engineers are required; one to do the main mix for the audience at FOH and another to do the monitor mix for the performers on stage. Once the signal arrives at an input on a mixing console, this signal can be adjusted in many ways by the sound engineer. A signal can be equalized (e.g., by adjusting the bass or treble of the sound), compressed (to avoid unwanted signal peaks), or panned (that is sent to the left or right speakers). The signal may also be routed into an external effects processor, such as a reverb effect, which outputs a wet (effected) version of the signal, which is typically mixed in varying amounts with the dry (effect-free) signal. Many electronic effects units are used in sound reinforcement systems, including digital delay and reverb. 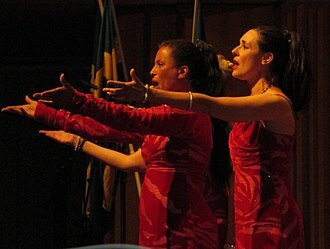 Some concerts use pitch correction effects (e.g., AutoTune), which electronically correct any out-of-tune singing. Mixing consoles also have additional sends, also referred to as auxes or aux sends (an abbreviation for "auxiliary send"), on each input channel so that a different mix can be created and sent elsewhere for another purpose. One usage for aux sends is to create a mix of the vocal and instrument signals for the monitor mix (this is what the onstage singers and musicians hear from their monitor speakers or in-ear monitors). Another use of an aux send is to select varying amounts of certain channels (via the aux send knobs on each channel), and then route these signals to an effects processor. A common example of the second use of aux sends is to send all of the vocal signals from a rock band through a reverb effect. While reverb is usually added to vocals in the main mix, it is not usually added to electric bass and other rhythm section instruments. The processed input signals are then mixed to the master faders on the console. The next step in the signal path generally depends on the size of the system in place. In smaller systems, the main outputs are often sent to an additional equalizer, or directly to a power amplifier, with one or more loudspeakers (typically two, one on each side of the stage in smaller venues, or a large number in big venues) that are connected to that amplifier. In large-format systems, the signal is typically first routed through an equalizer then to a crossover. A crossover splits the signal into multiple frequency bands with each band being sent to separate amplifiers and speaker enclosures for low, middle, and high-frequency signals. Low-frequency signals are sent to amplifiers and then to subwoofers, and middle and high-frequency sounds are typically sent to amplifiers which power full-range speaker cabinets. Using a crossover to separate the sound into low, middle and high frequencies can lead to a "cleaner", clearer sound (see bi-amplification) than routing all of the frequencies through a single full-range speaker system. Nevertheless, many small venues still use a single full-range speaker system, as it is easier to set up and less expensive. Many types of input transducers can be found in a sound reinforcement system, with microphones being the most commonly used input device. 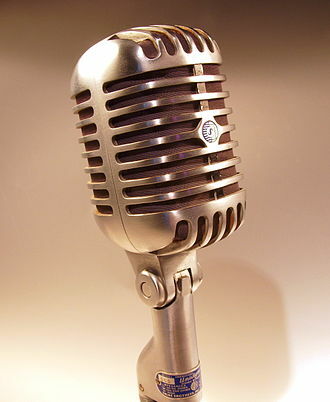 Microphones can be classified according to their method of transduction, polar pattern or their functional application. Most microphones used in sound reinforcement are either dynamic or condenser microphones. One type of directional microphone, called cardioid mics, are widely used in live sound, because they reduce pickup from the side and rear, helping to avoid unwanted feedback from the stage monitor system. Microphones used for sound reinforcement are positioned and mounted in many ways, including base-weighted upright stands, podium mounts, tie-clips, instrument mounts, and headset mounts. Microphones on stands are also placed in front of instrument amplifiers to pick up the sound. Headset mounted and tie-clip mounted microphones are often used with wireless transmission to allow performers or speakers to move freely. 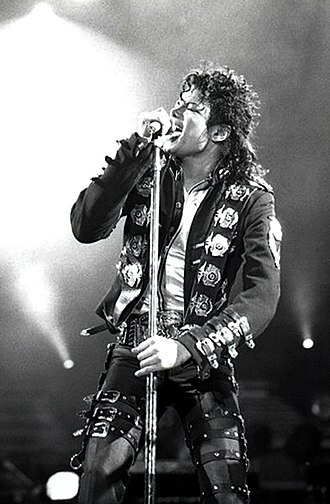 Early adopters of headset mounted microphones technology included country singer Garth Brooks, Kate Bush, and Madonna. Other types of input transducers include magnetic pickups used in electric guitars and electric basses, contact microphones used on stringed instruments, and pianos and phonograph pickups (cartridges) used in record players. Electronic instruments such as synthesizers can have their output signal routed directly to the mixing console. A DI unit may be necessary to adapt some of these sources to the inputs of the console. Wireless systems are typically used for electric guitar, bass, handheld microphones and in-ear monitor systems. This lets performers move about the stage during the show or even go out into the audience without the worry of tripping over or disconnecting cables. Mixing consoles are the heart of a sound reinforcement system. This is where the sound engineer can adjust the volume and tone of each input, whether it is a vocalist's microphone or the signal from an electric bass, and mix, equalize and add effects to these sound sources. Doing the mixing for a live show requires a mix of technical and artistic and creative skills. A sound engineer needs to have an expert knowledge of speaker and amplifier set-up, effects units and other technologies and a good "ear" for what the music should sound like in order to create a good mix. Multiple consoles can be used for different applications in a single sound reinforcement system. The front of house (FOH) mixing console is typically located where the operator can see the action on stage and hear what the audience hears. For broadcast and recording applications, the mixing console may be placed within an enclosed booth. Large music productions often use a separate stage monitor mixing console which is dedicated to creating mixes for the performers' on-stage. These consoles are typically placed at the side of the stage so that the operator can communicate with the performers on stage. In cases where performers have to play at a venue that does not have a monitor engineer near the stage, the monitor mixing is done by the FOH engineer from the FOH console. This arrangement can be problematic because the performers end up having to request changes to the monitor mixes with "...hand signals and clever cryptic phrases" which may be misunderstood. 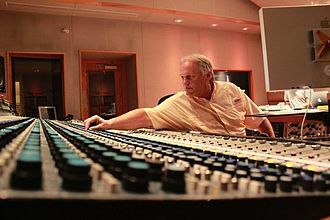 The engineer also cannot hear the changes that he is applying to the monitors on stage, often resulting in a reduction of the quality of the onstage monitor mix. Equalizers are electronic devices that allow audio engineers to control the tone and frequencies of the sound in a channel, group (e.g., all the mics on a drumkit) or an entire stage's mix. The bass and treble controls on a home stereo are a simple type of equalizer. Equalizers exist in pro sound reinforcement systems in three forms: shelving equalizers (typically for a whole range of bass and treble frequencies), graphic equalizers and parametric equalizers. 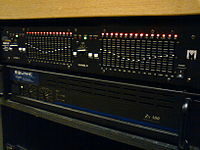 Graphic equalizers have faders (vertical slide controls) which together resemble a frequency response curve plotted on a graph. The faders can be used to boost or cut specific frequency bands. Using equalizers, frequencies which are too weak, such as a singer with modest projection in her/his lower register, can be boosted. Frequencies which are too loud, such as a "boomy" sounding bass drum, or an overly resonant dreadnought guitar can be cut. Sound reinforcement systems typically use graphic equalizers with one-third octave frequency centers. These are typically used to equalize output signals going to the main loudspeaker system or the monitor speakers on stage. Parametric equalizers are often built into each channel in mixing consoles, typically for the mid-range frequencies. They are also available as separate rackmount units which can be connected to a mixing board. Parametric equalizers typically use knobs and sometimes buttons. The audio engineer can select which frequency band to cut or boost, and then use additional knobs to cut or boost this frequency range. Parametric equalizers first became popular in the 1970s and have remained the program equalizer of choice for many engineers since then. A high-pass (low-cut) and/or low-pass (high-cut) filter may also be included on equalizers or audio consoles. High-pass (low-cut) and low-pass (high-cut) filters restrict a given channel's bandwidth extremes. Cutting very low frequency sound signals (termed infrasonic, or subsonic, a misnomer) reduces the waste of amplifier power which does not produce audible sound and which moreover can be hard on the low-range speakers. A low-pass filter to cut ultrasonic energy is useful to prevent interference from radio frequencies, lighting control hum, or digital circuitry creeping into the power amplifiers. Such filters are often included with graphic and parametric equalizers to give the audio engineer full control of the frequency range. If their response is steep enough, high-pass filters and low-pass filters function as end-cut filters[clarification needed]. A feedback suppressor is an automatically-adjusted band-reject or notch filter which includes a microprocessor to detect the onset of feedback "howls" and direct the filter to suppress the feedback by lowering the gain right at the offending frequency. Compressors are designed to help the audio engineer to manage the dynamic range (loudness) of an audio signal, or a group of audio signals. Prior to the invention of automatic compressors, audio engineers accomplished the same goal by "riding the faders", which mean listening carefully to the mix and lowering the faders of any singer or instrument which was getting too loud. A compressor accomplishes this by reducing the gain of a signal that is above a defined level (the threshold) by a defined amount (the ratio). Without this gain reduction, a signal that gets, say 10% louder as an input, will be 10% louder at the output. With the gain reduced, a signal that gets 10% louder at the input will be perhaps 3% louder at the output. Most compressors available are designed to allow the operator to select a ratio within a range typically between 1:1 and 20:1, with some allowing settings of up to ∞:1. A compressor with an infinite ratio is typically referred to as a limiter. The speed that the compressor adjusts the gain of the signal (called the attack) is typically adjustable as is the final output of the device. Reverberation and delay effects are widely used in sound reinforcement systems to enhance the sound of the mix and create a desired artistic effect. Reverb and delay add a sense of spaciousness to the sound, imitating the sound of a singing voice or instrument in a large, reverberant hall. Many mixing boards designed for live sound include on-board reverb effects. Modulation effects such as flanger, phaser, and chorus are also applied to some instruments. An exciter "livens up" the sound of audio signals by applying dynamic equalization, phase manipulation and harmonic synthesis of typically high frequency signals. 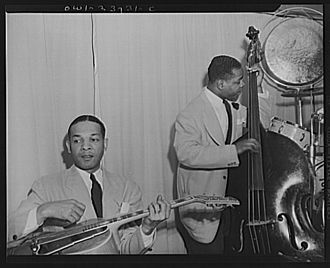 The appropriate type, variation, and level of effects is quite subjective and is often collectively determined by a production's audio engineer, artists, bandleader, music producer, or musical director. Reverb, for example, can give the effect of signal being present in anything from a small room to a massive hall, or even in a space that does not exist in the physical world. The use of reverb often goes unnoticed by the audience, as it often sounds more natural than if the signal was left "dry" (without effects). The use of effects in the reproduction of 2010-era pop music is often in an attempt to mimic the sound of the studio version of the artist's music in a live concert setting. For example, an audio engineer may use an Auto Tune effect to produce unusual vocal sound effects that a singer used on their recordings. A feedback suppressor detects unwanted audio feedback and suppresses it, typically by automatically inserting a notch filter into the signal path of the system, which prevents feedback "howls" from occurring. Audio feedback can create unwanted loud, screaming noises which are disruptive to the performance, and which can damage performers' and audience members' ears and speakers. Audio feedback from microphones occurs when a microphone "hears" the sound it is picking up through the monitor speakers or the main speakers. While microphone audio feedback is almost universally regarded as a negative phenomenon, in hard rock and heavy metal music, electric guitarists purposely create guitar feedback to create unique, sustained sounds with their guitar and guitar amplifier. This type of feedback is sought out by guitarists, so the sound engineer does not try to prevent it. A power amplifier is an electronic device which uses electrical power and circuitry to boost a low-voltage level signal (e.g., the signal from a vocalist's mic) and provides enough electrical power to drive a loudspeaker and produce sound. All speakers, including headphones, require power amplification. Most professional audio amplifiers also provide protection from clipped (overloaded) signals, as a power amplifier pushed into clipping can damage or destroy speakers. Amplifiers also typically provide protection against short circuits across the output, and excessive temperature (e.g., overheating). A limiter is often used to protect loudspeakers and amplifiers from power amp clipping. Audio engineers select amplifiers that provide enough headroom. "Headroom" refers to the amount by which the signal-handling capabilities of an audio system exceed a designated nominal level. Headroom can be thought of as a safety zone allowing transient audio peaks to exceed the nominal level without damaging the system or the audio signal, e.g., via clipping. Standards bodies differ in their recommendations for nominal level and headroom. When an audio engineer has selected an amplifier (or amplifiers) with enough headroom, this also helps to ensure that the signal will remain clean and undistorted. Like most sound reinforcement equipment products, professional amplifiers are typically designed to be mounted within standard 19-inch racks. 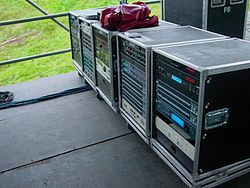 Rack-mounted amps are typically housed in road cases, sturdy plastic protective boxes which prevent damage to the equipment during transportation. 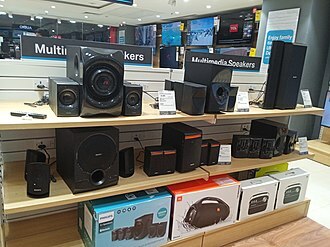 Active loudspeakers have internally mounted amplifiers that have been selected by the manufacturer to be a good amplifier for use with the given loudspeaker. Some active loudspeakers also have equalization, crossover and mixing circuitry built in. Digital loudspeaker management systems (DLMS) that combine digital crossover functions, compression, limiting, and other features in a single unit have become popular since their introduction.[when?] They are used to process the mix from the mixing console and route it to the various amplifiers. Systems may include several loudspeakers, each with its own output optimized for a specific range of frequencies (i.e. bass, midrange, and treble). Bi-amplification, tri-amplification, or quad-amplification of a sound reinforcement system with the aid of a DLMS results in a more efficient use of amplifier power by sending each amplifier only the frequencies appropriate for its respective loudspeaker. Most DLMS units that are designed for use by non-professionals have calibration and testing functions such as a pink noise generator coupled with a real-time analyzer to allow automated room equalization. An 18" Mackie subwoofer cabinet. Staff set up sound system speaker cabinets for an outdoor event. Many touring acts and large venue corporate events will rent large sound reinforcement systems that typically include one or more audio engineers on staff with the renting company. In the case of rental systems for tours, there are typically several audio engineers and technicians from the rental company that tour with the band to set up and calibrate the equipment. The individual that mixes the band is often selected and provided by the band, as they have become familiar with the various aspects of the show and have worked with the act to establish a general idea of how they want the show to sound. The mixing engineer for an act sometimes also happens to be on staff with the rental company selected to provide the gear for the tour. Setting up sound reinforcement for live music clubs and dance events often poses unique challenges, because there is such a large variety of venues which are used as clubs, ranging from former warehouses or music theaters to small restaurants or basement pubs with concrete walls. Dance events may be held in huge warehouses, aircraft hangars or outdoor spaces. In some cases, clubs are housed in multi-story venues with balconies or in "L"-shaped rooms, which makes it hard to get a consistent sound for all audience members. The solution is to use fill-in speakers to obtain good coverage, using a delay to ensure that the audience does not hear the same sound at different times. The number of subwoofer speaker cabinets and power amplifiers dedicated to low-frequency sounds used in a club depends on the type of club, the genres of music played there (live or via a DJ), and the size of the venue. A small coffeehouse where traditional folk, bluegrass or jazz groups are the main performers may have no subwoofers, and instead rely on the full-range main PA speakers to reproduce bass sounds. 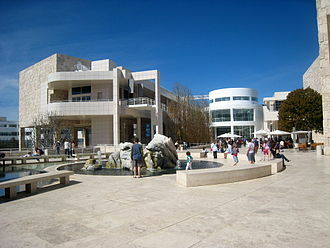 On the other hand, a club where hard rock or heavy metal music bands play or a nightclub where house music DJs play dance music may have multiple large 18" subwoofers in big cabinets and powerful amplifiers dedicated for subwoofers, as these genres and music styles typically use powerful, deep bass sound. A DJ gets his decks ready as the speaker cabinets are set up and readied for a dance event. Another challenge with designing sound systems for live music clubs is that the sound system may need to be used for both prerecorded music played by DJs and live music. If the sound system is optimized for prerecorded DJ music, then it will not provide the appropriate sound qualities (or mixing equipment and monitoring equipment) needed for live music, and vice versa. A club system designed for DJs needs a DJ mixer and space for record players. Clubs tend to focus on either live music or DJ shows. However, clubs which feature both types of shows may face challenges providing the desired equipment and set-up for both uses. In contrast, a live music club needs a mixing board designed for live sound, an onstage monitor system, and a multicore "snake" cable running from the stage to the mixer. Lastly, live music clubs can be a hostile environment for sound gear, in that the air may be hot, humid, and smoky; in some clubs, keeping racks of power amplifiers cool may be a challenge. Often an air conditioned room just for the amplifiers is utilised. The Iglesia Los Olivos church. P.A. speakers are mounted on the ceiling to reproduce the speech of the priest. Touring sound systems have to be powerful and versatile enough to cover many different halls and venues, and they are available many different sizes and shapes. 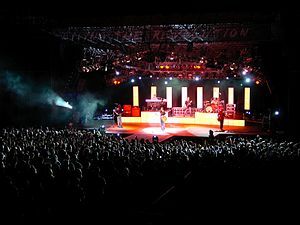 Touring systems range from mid-sized systems for bands playing nightclub and other mid-sized venues to large systems for groups playing stadiums, arenas and outdoor festivals. They also need to use "field-replaceable" components such as speakers, horns, and fuses, which are easily accessible for repairs during a tour. Tour sound systems are often designed with substantial redundancy features, so that in the event of equipment failure or amplifier overheating, the system will continue to function. Touring systems for bands performing for crowds of a few thousand people and up are typically set up and operated by a team of technicians and engineers who travel with the performers to every show. 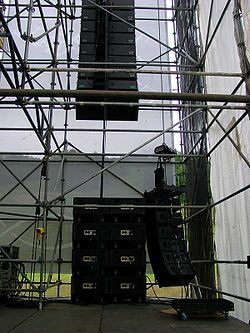 A Meyer line array of speaker cabinets is moved into position at an outdoor concert. Mainstream bands that are going to perform in mid- to large-sized venues during their tour schedule one to two weeks of technical rehearsal with the entire concert system and production staff, including audio engineers, at hand. This allows the audio and lighting engineers to become familiar with the show and establish presets on their digital equipment (e.g., digital mixers) for each part of the show, if needed. Many modern musical groups work with their Front of House and monitor mixing engineers during this time to establish what their general idea is of how the show and mix should sound, both for themselves on stage and for the audience. This often involves programming different effects and signal processing for use on specific songs, to make the songs sound somewhat similar to the studio versions. To manage a show with a lot of effects changes, the mixing engineers for the show often choose to use a digital mixing console so that they can save and automatically recall these many settings in between each song. This time is also used by the system technicians to get familiar with the specific combination of gear that is going to be used on the tour and how it acoustically responds during the show. These technicians remain busy during the show, making sure the SR system is operating properly and that the system is tuned correctly, as the acoustic response of a room or venue will respond differently throughout the day depending on the temperature, humidity, and number of people in the room or space. "Weekend band" PA systems are a niche market for small, powerful touring SR gear. Weekend bands need systems that are small enough to fit into a minivan or a car trunk, and yet powerful enough to give adequate and even sound dispersion and vocal intelligibility in a noisy club or bar. As well, the systems need to be easy and quick to set up. Sound reinforcement companies have responded to this demand by offering equipment that fulfills multiple roles, such as powered mixers (a mixer with an integrated power amplifier and effects) and powered subwoofers (a subwoofer with an integrated power amplifier and crossover). These products minimize the number of wiring connections that bands have to make to set up the system and they take less time to set up. Some subwoofers have metal speaker mount holes built into the top, so that they can double as a base for the stand-mounted full-range PA speaker cabinets. Lecture halls and conference rooms pose the challenge of reproducing speech clearly to a large hall, which may have reflective, echo-producing surfaces. 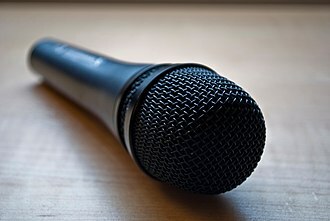 One issue with reproducing speech is that the microphone used to pick up the sound of an individual's voice may also pick up unwanted sounds, such as the rustling of papers on a podium. A more tightly directional microphone may help to reduce unwanted background noises. Another challenge with doing live sound for individuals who are speaking at a conference is that, in comparison with professional singers, individuals who are invited to speak at a forum may not be familiar with how microphones work. Some individuals may accidentally point the microphone towards a speaker or monitor speaker, which may cause audio feedback "howls". 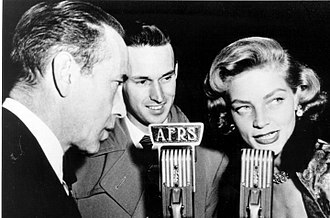 In some cases, when an individual who is speaking does not speak enough directly into the microphone, the audio engineer may ask the individual to wear a lavaliere microphone, which can be clipped onto a lapel. In some conferences, sound engineers have to provide microphones for a large number of people who are speaking, in the case of a panel conference or debate. In some cases, automatic mixers are used to control the levels of the microphones, and turn off the channels for microphones which are not being spoken into, to reduce unwanted background noise and reduce the likelihood of feedback. A speaker array mounted in the rafters in a camp sports facility. Systems for outdoor sports facilities and ice rinks often have to deal with substantial echo, which can make speech unintelligible. Sports and recreational sound systems often face environmental challenges as well, such as the need for weather-proof outdoor speakers in outdoor stadiums and humidity- and splash-resistant speakers in swimming pools. Another challenge with sports sound reinforcement setups is that in many arenas and stadiums, the spectators are on all four sides of the playing field. This requires 360 degree sound coverage. This is very different from the norm with music festivals and music halls, where the musicians are on stage and the audience is seated in front of the stage. A sound reinforcement system should be able to accurately reproduce a signal from its input, through any processing, to its output without any coloration or distortion. However, due to inconsistencies in venue sizes, shapes, building materials, and even crowd densities, this is not always possible without prior calibration of the system. This can be done in one of several ways. The oldest method of system calibration involves a set of healthy ears, test program material (i.e. music or speech), a graphic equalizer, and last but certainly not least, a familiarity with the proper (or desired) frequency response. One must then listen to the program material through the system, take note of any noticeable frequency changes or resonances, and subtly correct them using the equalizer. Experienced engineers typically use a specific playlist of music that they have become very familiar with every time they calibrate a new system. This "by ear" process is still done by many engineers, even when analysis equipment is used, as a final check of how the system sounds with music or speech playing through the system. ^ Eargle & Foreman 2002, p. 299. ^ Eargle & Foreman 2002, p. 167. ^ Sound Equipment - Loudspeakers, Amplifiers, Signal Processors, Mixers, Music Source & Microphones Archived 2012-01-08 at the Wayback Machine. Retrieved on 2011-12-11. ^ Eargle & Foreman 2002, p. 62. ^ Badhorn, Philippe (February 2006). "Interview in Rolling Stone (France)". Rolling Stone. ^ Reverberation. Harmony-Central. Retrieved on January 23, 2009. ^ "Q. What exactly is 'headroom' and why is it important?". Sound on Sound. February 2010. 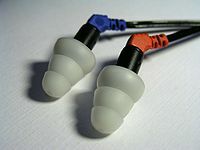 ^ a b "In-Ear Monitors: Tips of the Trade". Retrieved 2009-01-24. ^ LiveDesignOnline.com. Kai Harada, Mar 1, 2001. Opera's Dirty Little Secret. Retrieved on March 24, 2009. ^ Rat, Dave. "When Hearing Starts To Drift". Archived from the original on 2001-12-26. Retrieved 2007-04-26. A rock band or pop band is a small musical ensemble which performs rock music, pop music or a related genre. 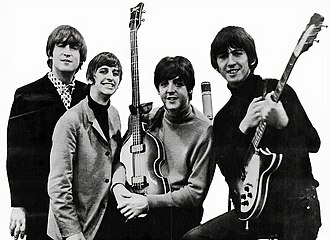 The four-piece band is the most common configuration in rock and pop music, before the development of the electronic keyboard, the configuration was typically two guitarists, a bassist, and a drummer. Another common formation is a vocalist who does not play an instrument, electric guitarist, bass guitarist, these bands can be considered as trios. The smallest ensemble that is used in rock music is the trio format. Two-member rock and pop bands are relatively rare, because of the difficulty in providing all of the elements which are part of the rock or pop sound. Some well-known power trios with the guitarist on lead vocals are The Jimi Hendrix Experience, Stevie Ray Vaughan and Double Trouble, The Jam, and ZZ Top. Two-member rock and pop bands are relatively rare, because of the difficulty in providing all of the elements which are part of the rock or pop sound. 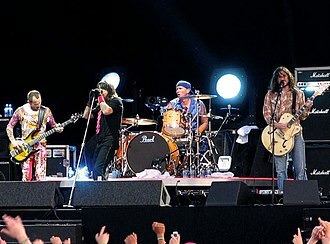 Two-member rock and pop bands typically omit one of musical elements. In many cases, two-member bands will omit a drummer, since guitars, bass guitars, Diet Cig and Royal Blood. When electronic sequencers became widely available in the 1980s, this made it easier for bands to add in musical elements that the two band members were not able to perform. Sequencers allowed bands to pre-program some elements of their performance, such as a drum part. Two-member pop music such as Soft Cell and Yazoo used pre-programmed sequencers. Other pop bands from the 1980s which were fronted by two performers, such as Wham. Eurythmics and Tears for Fears, were not actually two-piece ensembles, two-piece bands in rock music are quite rare. However, starting in the 2000s, blues-influenced rock bands such as The White Stripes and The Black Keys utilized a guitar, this is predated by the Flat Duo Jets and House of Freaks from the 1980s. Death from Above 1979 featured a drummer and bass guitarist, tenacious D is a two-guitar band, One Day as a Lion and The Dresden Dolls both feature a keyboardist and a drummer. Reverberation, in psychoacoustics and acoustics, is the persistence of sound after a sound is produced. This is most noticeable when the sound source stops but the reflections continue, decreasing in amplitude, until they reach zero amplitude. In comparison to an echo that is a minimum of 50 to 100 ms after the initial sound. As time passes, the amplitude of the reflections is reduced until it is reduced to zero, Reverberation is not limited to indoor spaces as it exists in forests and other outdoor environments where reflection exists. Reverberation occurs naturally when a person sings, talks or plays an instrument acoustically in a hall or performance space with sound-reflective surfaces. The sound of reverberation is often added to the vocals of singers in live sound systems. The time it takes for a signal to drop by 60 dB is the reverberation time, RT60 is the time required for reflections of a direct sound to decay 60 dB. Reverberation time is stated as a single value, if measured as a wide band signal, being frequency dependent. Being frequency dependent, the time measured in narrow bands will differ depending on the frequency band being measured. For precision, it is important to know what ranges of frequencies are being described by a time measurement. In the late 19th century, Wallace Clement Sabine started experiments at Harvard University to investigate the impact of absorption on the reverberation time. Using a portable wind chest and organ pipes as a sound source and he found that the reverberation time is proportional to room dimensions and inversely proportional to the amount of absorption present. The optimum reverberation time for a space in which music is played depends on the type of music that is to be played in the space, rooms used for speech typically need a shorter reverberation time so that speech can be understood more clearly. If the reflected sound from one syllable is still heard when the syllable is spoken. Cat and Cap may all sound very similar, if on the other hand the reverberation time is too short, tonal balance and loudness may suffer. In the 2010s, a mixer is able to control analog or digital signals, depending on the type of mixer. The modified signals are summed to produce the output signals. A typical, simple application combines signals from two microphones into an amplifier that drives one set of speakers simultaneously, a DJ mixer may have only two channels, for mixing two record players. A coffeehouses tiny stage might only have a six channel mixer, a nightclub stages mixer for rock music shows may have 24 channels for mixing the signals from a rhythm section, lead guitar and several vocalists. 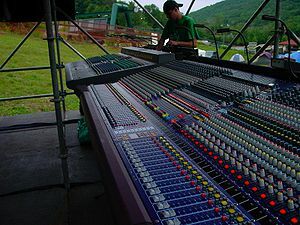 A mixing console for a large concert may have 48 channels, a mixing console in a professional recording studio may have as many as 96 channels. In practice, mixers do more than simply mix signals, some mixers have onboard electronic effects, such as reverb. Some mixers intended for small venue live performance applications may include a power amplifier. A mixing console is known as a mixer, audio console, mixing desk, sound mixer, sound board. A typical analog mixing board has three sections, Channel inputs Master controls Audio level metering The channel input strips are usually a bank of identical monaural or stereo input channels. Each channel has rotary knobs, buttons and/or faders for controlling the gain, the master control section is used to adjust the levels of the overall output of the mixer. The master control section has sub-group faders, master faders, master auxiliary mixing bus level controls, in addition it may have solo monitoring controls, a stage talk-back microphone control, muting controls and an output matrix mixer. On smaller mixers the inputs are on the left of the mixing board, in larger mixers, the master controls are in the center with input faders and channel strips on both sides. The audio level meters may be above the input and master sections or they may be integrated into the input, the audio level meters indicate when the signals are clipping. Each signal that is plugged into the mixer has its own channel, depending on the specific mixer, each channel is stereo or monaural. As such, a loudspeaker cannot be used without installing it in a cabinet of some type, or mounting it into a wall or ceiling. The enclosure plays a role in managing vibration induced by the frame and moving airmass within the enclosure, as well as heat generated by driver voice coils. Sometimes considered part of the enclosure, the base, may include specially designed feet to decouple the speaker from the floor, enclosures designed for use in PA systems, sound reinforcement systems and for use by electric musical instrument players. Speaker enclosures are used in homes in stereo systems, home cinema systems, boom boxes, small speaker enclosures are used in car stereo systems. Speaker cabinets are key components of a number of applications, including sound reinforcement systems, movie theatre sound systems. 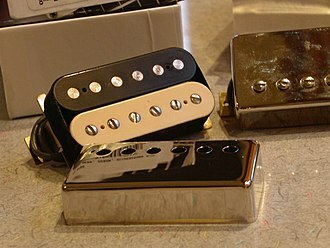 Electric musical instruments invented in the 20th century, such as the guitar, electric bass and synthesizer, among others, are amplified using instrument amplifiers. Early on, radio loudspeakers consisted of horns, often separately from the radio itself. When paper cone loudspeaker drivers were introduced in the mid 1920s and these cabinets were made largely for the sake of appearance, with the loudspeaker simply mounted behind a round hole in the cabinet. 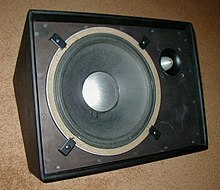 It was observed that the enclosure had an effect on the bass response of the speaker. This results in a loss of bass and comb filtering, before the 1950s many manufacturers did not fully enclose their loudspeaker cabinets, the back of the cabinet was typically left open. This was done for reasons, not least because electronics could be placed inside. In some respects, the mounting for a low-frequency loudspeaker driver would be a rigid flat panel of infinite size with infinite space behind it. This would entirely prevent the sound waves from interfering with the sound waves from the front. An open baffle loudspeaker is an approximation of this, since the driver is mounted on a panel, a speaker driver mounted on a finite baffle will display a physical phenomenon known as interference which can result in a perceivable frequency-dependent sound attenuation. An audio multicore cable is a thick cable which contains from four to 64 individual audio cables inside a common, sturdy outer jacket. Audio multicore cables are used whenever multiple audio signals, for example from a number of microphones. Typical professional audio applications include audio recording, sound reinforcement, PA systems and it would be easy for the cables to become tangled, and it would be very hard for the audio engineers connecting the mic cables to the mixing board to determine which cable is for which mic. Different termination methods can be used on end to suit the application. When individual connectors are used, three pin XLR connectors are most common, although 1/4 jack connectors are occasionally used, the availability of portable snakes enables sound engineers to set up sound systems at temporary outdoor locations, such as music festivals. Snakes are permanently installed in the walls of recording studios and performance such as arts centres. The vast majority of audio multicore cables consist of a number of copper wires. However, the broadcast industry tends to use audio multicores containing starquad cables, some multicore cables designed for unbalanced audio are made, and they contain a number of single-core screened cables. The individual cables inside the multicore are usually individually screened, a foil-screen is typically used, comprising thin aluminium wrapped around the conductors. An uninsulated drain wire is contained inside the screen to facilitate ground connection, a less common construction is a lapped or braided screen comprising thin wires wrapped around the conductors. This gives improved flexibility, but less effective screening and this describes the method used to isolate the screening between individual cores, two approaches are common. The first method has a plastic sheath around each individual core. The second method dispenses with the sheath and typically wraps the screening with very thin plastic. The individually sheathed construction has the advantage that individually cores can easily be terminated to individual connectors at the ends of the cable and its disadvantage is that the size and weight of the cable are increased. Equalization is the process of adjusting the balance between frequency components within an electronic signal. The most well known use of equalization is in recording and reproduction but there are many other applications in electronics. The circuit or equipment used to achieve equalization is called an equalizer and these devices strengthen or weaken the energy of specific frequency bands or frequency ranges. In sound recording and reproduction, equalization is the commonly used to alter the frequency response of an audio system using linear filters. Most hi-fi equipment uses relatively simple filters to make bass and treble adjustments and parametric equalizers have much more flexibility in tailoring the frequency content of an audio signal. An equalizer is the circuit or equipment used to achieve equalization, since equalizers, adjust the amplitude of audio signals at particular frequencies, they are, in other words, frequency-specific volume knobs. The term EQ specifically refers to this variant of the term and basic guitar amplifiers typically have adjustable equalizers which boost or cut bass or treble frequencies. Mid- to high-priced guitar and bass amplifiers usually have more bands of frequency control, such as bass, mid-range and treble or bass, low-mid, high-mid, some amps have an additional knob for controlling very high frequencies. 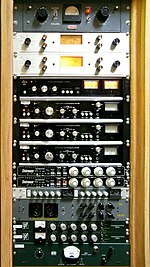 Broadcast and recording studios use sophisticated equalizers capable of more detailed adjustments. The most common equalizers in music production are parametric, semi-parametric, peak, graphic equalizers are often included in consumer audio equipment and software which plays music on home computers. Parametric equalizers require more expertise than graphic equalizers, and they can provide more specific compensation or alteration around a chosen frequency and this may be used in order to remove unwanted resonances or boost certain frequencies. An acoustic guitarist who finds that her instrument sounds too boomy may ask the engineer to reduce the low frequency range response. 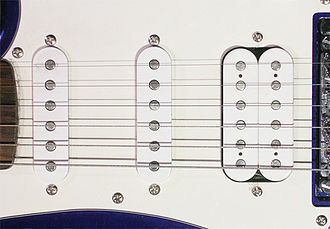 A guitarist who finds that the instrument sound in the PA has too much finger noise may ask the engineer to reduce the frequency range response. Crossovers are often described as two-way or three-way, which indicate, that the crossover splits a given signal into two frequency ranges or three frequency ranges. Crossovers are used in cabinets, power amplifiers in consumer electronics and pro audio. For the latter two markets, crossovers are used in amplifiers, keyboard amplifiers and keyboard speaker enclosures. Most hi-fi speaker systems and sound reinforcement system speaker cabinets combination of loudspeaker drivers. A standard simple example is hi-fi and PA system cabinets that contain a woofer for low and mid frequencies, Active crossovers come in both digital and analog varieties. Digital active crossovers often include additional signal processing, such as limiting, signal crossovers allow the audio signal to be split into bands that are processed separately before they are mixed together again. Some examples are, multiband dynamics, multiband distortion, bass enhancement, high frequency exciters, the definition of an ideal audio crossover changes relative to the task and audio application at hand. This ideal performance can only be approximated, how to implement the best approximation is a matter of lively debate. Satisfactory output of the system comprising the audio crossover and the loudspeaker drivers in their enclosure is the design goal. Such a goal is achieved using non-ideal, asymmetric crossover filter characteristics. Many different crossover types are used in audio, but they belong to one of the following classes. Loudspeakers are often classified as N-way, where N is the number of drivers in the system, for instance, a speaker with a woofer and a tweeter is 2-way. An N-way speaker usually has an N-way crossover to divide the signal among the drivers, a 2-way crossover consists of a low-pass and a high-pass filter. A 3-way crossover is constructed as a combination of low-pass, band-pass and high-pass filters, the BPF section is in turn a combination of HPF and LPF sections. 4 way crossovers are not very common in design, primarily due to the complexity involved. An extra HPF section may be present in an N-way loudspeaker crossover to protect the driver from frequencies lower than it can safely handle. Members of the Grateful Dead perform at Red Rocks Amphitheatre in Colorado on August 11, 1987. Metallica while performing in London, December 19, 2003. Inside view of Ruca Che arena in Neuquén, Argentina, during a rock concert. A multicore cable "snake" helps sound engineers to route a number of signals through a single cable to a mixing board some distance from the stage.